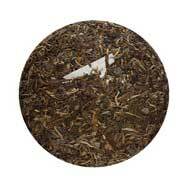 Nan Nuo Shan Bing Cha is compressed using tea leaves picked from wild grown tea trees in Nan Nou Mountain. This mountain is located in Meng Hai County and is renowned for its dense forest and misty weather all year long. It is an environment that allows the tea trees to produce very high quality tea leaves. This tea cake is compressed using traditional stone pressing method. Drank today 27 May 10 the 08 production after airing in 70 to 80% humidity for a few months. Smell slightly floral. Taste slightly sweet honey and moderately floral. Smoky infusions detected for first few infusions. Very pleasant for daily drink for beginners, but lack complexity. Good for 6 to 8 rounds before vegetal taste take over. 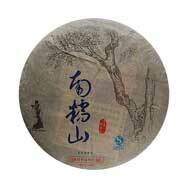 Good value and taste better than many other similar priced puer. very good nice fruitiness will be good for aging. 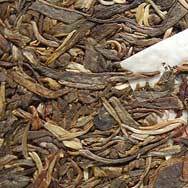 this puer has a nice bittersweet flavor to drink with rich food. Haven´t tasted it yet, but it looks and smells good. In a couple of years it will probably be a fine puer. Broad leaves, nice aroma. Infusion is nice brilliant yellow colour, floral aroma, smooth, mild, bitter-sweet after-taste.